Printing parts such as this at the UL AMCC (shown is an aluminum build on a 3D Systems machine) gives students opportunities to learn best practices, such as designing the part to enable part clamping for downstream operations—note the added siderails. Students also learn to avoid some of the common causes of build failures: dirty lens, over-support, excess cross-section and more. Words of wisdom from a man who has worked in additive manufacturing for nearly 20 years—Ed Tackett, director of educational programs at the new Underwriters Laboratories (UL) Additive Manufacturing Competency Center (AMCC). Located on the campus of the University of Louisville (KY), the UL AMCC opened on February 16, 2016, and already has trained several dozen operators in the ins and outs of 3D metal-printer setup, operation, troubleshooting and maintenance. And, of course, safety—a topic of extreme importance to Tackett and to his counterpart at the new facility, Paul Bates, general manager of the UL AMCC. The UL AMCC houses two 3D metal-printing machines, including the EOS model shown. Here, students learn the importance of safety, particularly when handling metal powders. They’re wearing 3M Versaflow positive-airflow respirators. Fire-hazard reduction and firefighting procedures even receive attention when Tackett instructs students at the AMCC, discussing topics such as the use of antistatic mats underneath the printers, and the wearing of antistatic shoes by operators. Tackett and Bates can’t talk enough about the need for safety training in the metal-additive space, and I’m sure much work will be done soon to more clearly define roles and responsibilities. But Tackett, as we toured the AMCC, clearly stresses one last point: The most dangerous machine in the operation of a metal-printing system is the wet separator, used to clean up spilled powder. Over time, sludge can build up in the bottom the separator and clog the unit. UL AMCC director of educational programs Ed Tackett discusses the importance of support-structure design and part orientation on the build plate, keeping in mind stress buidup in the part during build, as well as consideration of downstream operations —support removal and part finishing. Tackett then notes the AMCC’s development work with a local filter company, Kinetic Filtration (see accompanying sidebar), to develop a system for separating the fine metal powders from the wet-separator liquid. “Following the proper testing by local, state and federal agencies, the wet-separator liquid may then be eligible for gray-water disposal,” Tackett says. A critical processing variable, and one that is easy to control and that will have the biggest impact on build quality, is build-plate flatness and how level it is in the machine. Companies should, for example, surface-grind the top of the plate to within 5 microns corner to corner. Of course, Tackett’s week-long curriculum covers much more than just safety, diving deeply and broadly into nearly every aspect of metal-additive manufacturing, including part and support design, machine setup, and troubleshooting. A key component of the AMCC’s curriculum deals with part and support design for optimizing downstream operations—support removal and part finishing. In addition to its two printers, the 15,000-sq.-ft. facility also houses equipment for machining, metrology and powder handling. When it comes time to build the 3D metal-printed parts, the most important processing variable, in Tackett’s mind, and one that is easy to control and that will have the biggest impact on build quality, is build-plate flatness and how level the platform is. Companies need a process to validate their build plates before every build, Tackett stresses. They should, for example, surface-grind the top of the plate to within 5 microns corner to corner. The AMCC even provides students with a pair of checklists for this activity—one for platform leveling and one for build-plate inspection. For inspecting surface roughness of the build plate, the checklist requires measurement at five locations on the plate—at each corner and in the center. Other checklists provided to students address STL-file prep and load (19 steps), and machine setup (21 steps, including cleaning the chamber and window, sanding and cleaning the build plate, inspecting the recoater, and leveling and tightening the build plate). Other key aspects to AM-machine setup to help ensure sound builds, according to Tackett, include testing the incoming powder for particle-size, among other characteristics; and ensuring the purity of the argon gas entering the build chamber. As far as ensuring optimal gas purity in the build chamber, Tackett suggests as a best practice to use stainless-steel supply lines with Swagelok (or similar) fittings. “That’s the ideal setup for reactive metals,” he says. We also spied a new argon manifold that allows the operator to check argon flow and purity while the system operates, and upload that data to an SPC report, “to provide complete traceability,” Tackett notes. During our visit to the UL AMCC, we spied a newly developed system for simplifying wet-separator maintenance that enables efficient recycling of the trapped metal powders, and of the wet-separator liquid. Developed by Kinetic Filtration, a Louisville, KY, manufacturer, in conjunction with the AMCC, the wet-separator maintenance kit includes its patented Hazo-loc filter, which attaches to the liquid outlet of the wet separator and traps the metal particulate. Also included in the kit is a 30-ga. drum to collect the filtered water; a drain funnel for the top of the drum; a pressurized water rinse and spray unit; and quick-release clamps. With proper use of the kit, manufacturers can avoid hefty fees for disposing liquid hazardous waste, while minimizing wet-separator maintenance time. And, they’ll minimize employee exposure to potentially harmful substances. 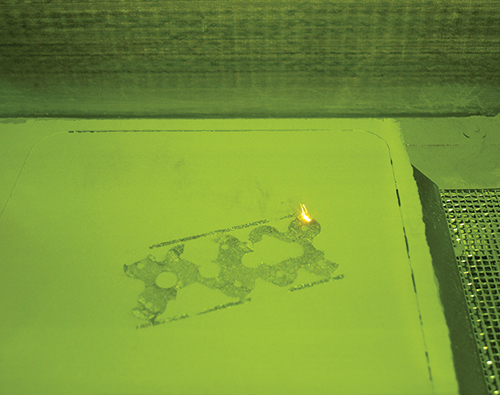 In addition to providing insightful gems regarding best practices and training tips, Tackett and Bates note trends promising to impact the 3D metal-printing landscape—now and into the future. First and foremost, they agree that the primary barrier to rapid acceptance of metal printing for production applications is a lack of qualified operators. And, of course, training operators is their mission. 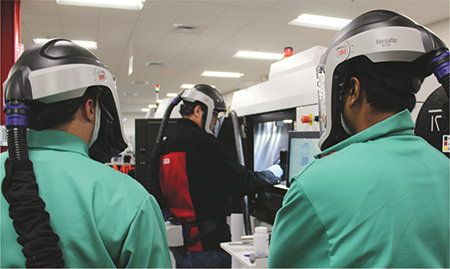 “We’re here to help manufacturers minimize the learning curve and get their metal-AM machines up and running, producing good parts, as quickly as possible,” says Bates. The center has two machines for training (from EOS and 3D Systems), with plans to soon add machines from other OEMs. 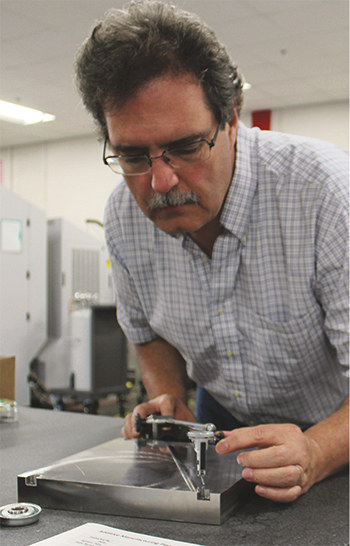 The University of Louisville has some 40 researchers working on additive-manufacturing projects, all aimed at helping make the “juice worth the squeeze.” That is, finding ways to leverage the process and the machines to ensure that AM outperforms other conventional manufacturing methods, so that resulting parts are stronger, lighter and perform better in service, without necessarily costing more to produce. 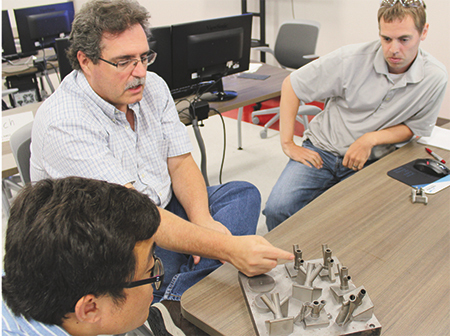 “Yes, there is an opportunity to additively manufacture legacy parts,” Tackett says. “But in these cases you’re likely looking at redesigns to make the parts more printable—optimize the design for AM.